Wednesday update ... still no sign of Fluffy, her Mom has posted fliers, made calls and visited what neighbors we have, but there aren't too many full time residents here. We are still purring and purraying, and are so thankful that you are too, furriends. But we are sad ... we don't think things are looking good for Fluffy. Monday update ... unfortunately Fluffy is still missing, and we are even more worried because we are supposed to get really bad weather here, ice, sleet and snow. Hopefully with all of our purrs and purrayers she will make it home safely. We know we have been really, really bad about posting and commenting (Momma's fault of course, we need to work on her as far as being so lax), but we needed to post this on our bloggy today. Our neighbor cat Fluffy has been missing since Friday night, and her Mom Cynthia (who is Momma's great friend here at the Lake) and Cynthia's family really miss her and are very worried about her. Any purrs and purrayers would be very much appreciated ... we know how wonderful and supportive our CB family is and told Cynthia we would post this, and she is very grateful for any purrs and purrayers that can be sent for Fluffy's safe return. We are purring hard and purraying Fluffy will return safely SOON! Oh, dear, we hope Fluffy comes home soon! It's no fun when a pet is missing. Big purrs from alla us for Fluffy to come back home, and soon! Oh noes! I had just posted a comment on Cat Blogosphere and then your comment showed up! Purrs & prayers from the Teenage Mutant Ninja Kitty Horde & their Feeders!! Don't let her give up! My aunt Susan had one of her babies lost for two weeks. He came home with a two broken legs which is probably why it took so long. But after a visit or two to the vet followed by rest, recuperation and lots of treats & loving he was fine! We hope that Fluffy's tale turns out MUCH better!! We will purr for Fluffy to come home safe! Oh no! We are purring that Fluffy comes home soon!! 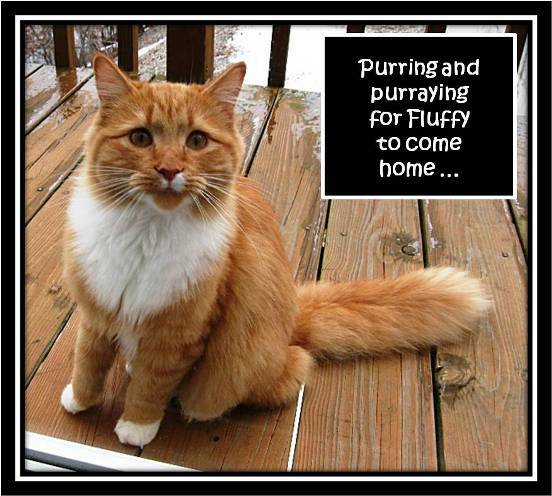 Purrrs for Fluffy to come home!! We know all about missing kitties and we pray for a safe and fast return!! Tell Fluffy's family not to give up hope. Our furry tuxie Patrick (now lives with my daughter in another town) went on a walk-about last October and it was cold and snowy, and we think he got lost in the 79 acres of prairie around us, but found his way home after 5 long days!!! Fluffy, please get your tail back home. Your beans are missing you bigtime. Oh no, we'z purring and purraying dat Fluffy comes home...please, guardian angel, guide Fluffy back! Sending positive thoughts and Purrs that Fluffy returns home safely and SOON ! We are purring hard for Fluffy to come home. I'm purring and purraying for Fluffy to find her way back to her home real soon. We will start purring hard! Nanny and I are purring for Fluffy to find her way back. Fluffy is still missing, and as you pointed out Ozark Mountain Cats, the bad weather will be setting in and that makes us even more worried, with ice, sleet and snow on the way. We thank all of our wonderful furriends for purring and purraying for Fluffy as we are, and hopefully she will come home or someone found her and is taking care of her. Oh, dear, we really do hope he comes home before the really bad weather hits. Purrs and tail wags for Fluffy to be safe. We have a suggestion. Ask your friend to vacuum her home throughly, the more dust bunnies the better, also vacuum Fluffy's beds and sleeping places and the human beds. Then empty the vacuum bag outside, all around the house - you can put little piles of dust on the edges of the yard too. The smell of "home" travels far and wide and Fluffy might just get a whiff of it and if he's lost his bearings, it could help him find his way home. The dust piles need topping up every few days. We are sending rumbly, home-again purrs for Fluffy!! As hard as it is, don't give up hope, despite the bad weather. He might have been accidentally locked in someone's garage or something. But we can imagine his mom's despair right now. Soft purrs and tail wags. Hello! We popped over to offer our purrs for Fluffy's safe return. It must be such a worry ~ but we too suspect someone is keeping Fluffy warm and safe from the storm. Poor Fluffy!!! I am adding my purrs and hope that she would be safe from the bad weather and come home. Oh no! We are behind with our visiting and just saw your friend Fluffy is missing. We are sending lots of purrs and hope they help to guide him home. We just saw that your neighbor's Fluffy is missing and I just wanted to tell you that the Donkey's hooves really are crossed so that Fluffy will come home. We also wanted to tell you that one of our sisters went missing in July last summer and she came home in October. She was thin but very happy to be home. We are sending lots of purrs too for her return. Lots of purrs for Fluffy to come home. Stretch from the herd who is an inside only cat went missing in December 2 years ago for exactly a week in -2 degree weather with ice and snow on the ground so keep up hope!! We're still hoping for the best. Fluffy's family must be beside themselves with worry!!! We are still purring and praying that she comes home safe. Sniffie went missing overnight once. Knock on every door and enlist the neighborhood kids. You would be surprised what they see. We'll purr loud and hard for Fluffy's safe return. Fluffy is out in this weather? Oh noes! We're gonna purr and purrayer real hard! I am purring really hard that Fluffy comes home soon.